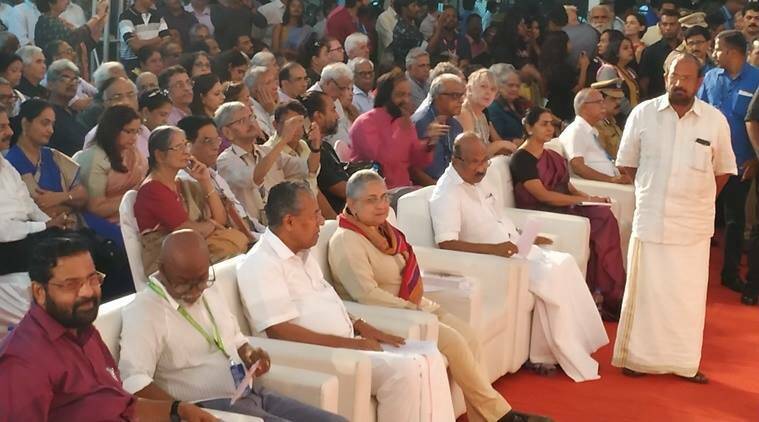 Kerala Chief Minister Pinarayi Vijayan Wednesday threw open the fourth edition of the Kochi Muziris Biennale, a 108-days long celebration of contemporary art featuring close to 90 artists from across the globe. At a function held at the Parade Ground in Fort Kochi, Vijayan underlined the importance of art in life and the role that the Biennale plays in making Kochi a melting pot of different shades of artistic talent. He also touched upon the financial fragility of the state government in the wake of the devastating floods in August, and how the administration has chosen not to keep a distance away from the conduct of the Biennale. “As you know, Kerala is on the path of reconstruction after the floods. I’d like to underline that despite the financial constraints, the government did not want the Biennale to be affected in any way. The government has allotted the same funds that were allotted the last time,” the chief minister said. “The government’s stand is not to keep a distance away from art by making flimsy excuses. If life has to be complete, art is necessary. In the absence of art, human life sinks down to the quality of animal life. Art and culture makes life meaningful. The government does not want to make any compromise on developing art in the state,” he added. The Biennale this year has a specialty – it has it’s first woman curator in Anita Dube, an accomplished contemporary artist who has chosen the theme ‘Possibilities for a non-alienated life’ for the projects this year. The Biennale has also more female and queer artists than men. “When I was given the responsibility of curating the festival, I began with a dream. I am happy to have accomplished it,” Dube said. The Biennale, which will go on till March 29, 2019, features 94 artist projects by over 100 independent artists across ten venues, mainly in Ernakulam, Fort Kochi and Mattancherry. Apart from art installations, there are infra projects, lectures, movie screenings, music performances and workshops. There is also an exclusive ‘Students Biennale’, organised by selected groups of college students from across the country. In 2016-17, close to 6 lakh people had visited the Biennale.